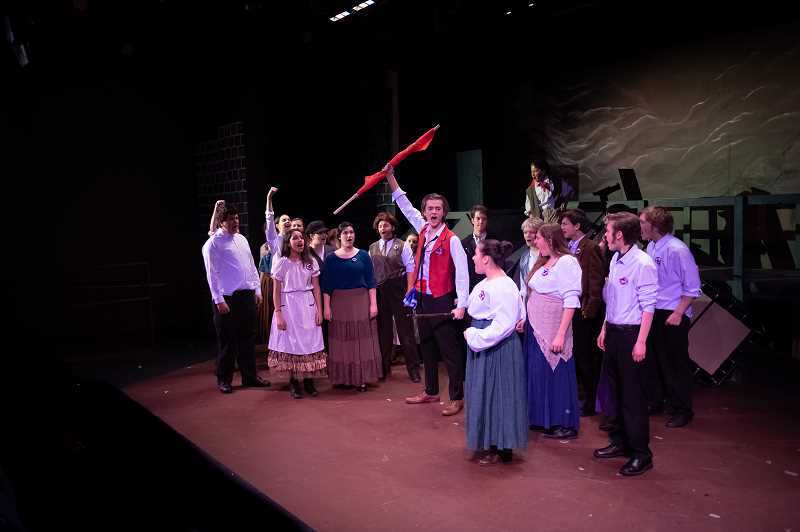 As we open 2019, I cannot imagine a better time for passionate young people to take to the stage for a powerful show about sacrifice, honor and social justice; in other words, for Hillsboro's STAGES Performing Arts Youth Academy to present the school edition of "Les Misérables." Director Luis Ventura and musical director Erin Riha have managed to attract a truly first-rate group of young actors (age range is 13 to 18) and molded them into a dynamic ensemble accented by powerful lead performances that do full justice to Alain Boublil and Claude-Michel Schonberg's adaptation of the classic Victor Hugo story. For those not already immersed in the world of "Les Mis" fandom, the story is complex and sometimes confusing, moving from Digne to Montreuil to Paris, and from 1815 to 1823 to 1832 — all with no spoken dialogue. However, when the words, "Will you join in our crusade? Who will be strong and stand with me…It is the future that they bring, when tomorrow comes!" ring out, it's impossible to miss the passionate relevance of the tale — I could not help but think of the kids from Parkland. In short, this cast made me care about the characters and the story — high praise from someone who is, in general, not a "Les Mis" fan. In a nutshell: 19th-century France is wracked with poverty and social inequality. Hero Jean Valjean is released on parole after 19 of his 20-year sentence for stealing a loaf of bread. He breaks parole, infuriating Inspector Javert, who becomes obsessed with seeing Valjean punished. Valjean assumes a new identity, becomes a wealthy factory owner, and learns that one of his employees, Fantine, has been unjustly fired and driven to prostitution to support her daughter Cosette. Fantine dies, but Valjean vows to take care of Cosette. Valjean pays a handsome price to free Cosette from the evil Thénardiers, but is forced to reveal his real identity and flee from Javert. The Thénardiers' daughter Éponine loves young student Marius, who falls for Cosette. Marius could flee with Cosette and Valjean, but chooses to stay to fight on the barricades with fellow idealistic rebels. The students capture Javert as a spy, but Valjean shows up, shows him mercy, and releases him. As the barricades fall and the rebels are massacred, Marius is severely wounded, but Valjean finds him and carries him through the sewers to safety. Javert dies, Cosette and Marius are wed, Valjean dies. People sing a lot, followed on opening night by a spontaneous and heartfelt standing ovation from a full and enthusiastic house. Isaac Chapelle (Jean Valjean) is a real find — an accomplished vocalist who makes the challenging role seem effortless, whose robust vocals can be easily heard over the music, and who is a skilled enough actor bridge the 17-year gap in his age from prologue to closing (despite a less-than-believable beard). The show would be worth attending just to watch him, but he is ably supported by the other leads and a versatile ensemble cast. Three key women (Anna Brenner as Fantine, Ruth Hailey as Cosette and Sherwood's Rachel Doyel as Éponine) bring amazing vocal chops to the stage, owning their roles and giving heart-breaking authenticity to their stories. Benjamin McGregor and Noelle Parent as the despicable Thénardiers offer spectacular comic relief, going close but never completely over the top. Zakeus Vertner seems like a classic loveable scamp as Gavroche, yet he creates a character who evokes an audible gasp when shot on the barricades (for me, the most "Parkland" moment of the show). With my apologies to the rest of the cast — there were several other notable performances — I must single out ensemble member Annika Hyatt, who gave remarkable intensity to a series of minor roles. Sets, costuming, and lighting all exceeded my expectations for a youth performance by a mile, and a close look at the program makes it clear that it took a village to mount this amazing production. STAGES founder Cindy Williams, along with Ventura and Riha, have given 30 young performers the chance to perform in a beautiful "bucket list" show that should nurture their love for theater while showing the world that youth theatre can rival, and even best, many adult productions. Currently, all performances are sold out.